This post is the latest update to a series of blog posts seen on the CalculatedRisk.com blog. 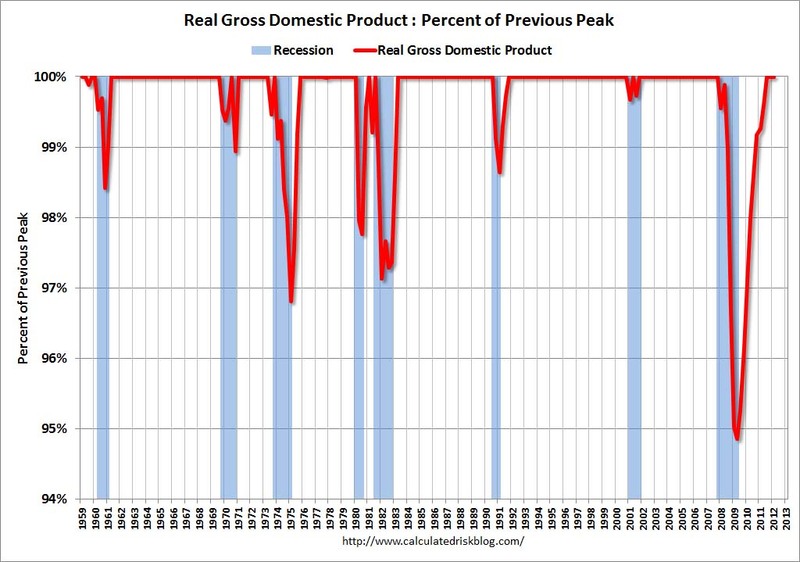 The original blog post of April 12, 2010, is titled “Recession Measures.” In it, Bill discussed key measures that the NBER uses to determine recoveries, and posted four charts. 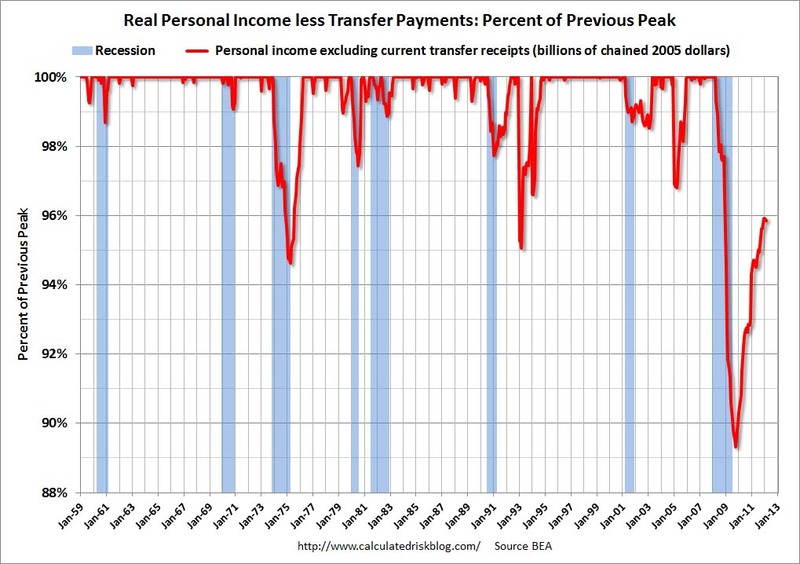 Here are those charts, updated in his April 29, 2012 post titled “Recovery Measures.” The charts are constructed in a fashion different than most – in a “percent of peak” fashion. 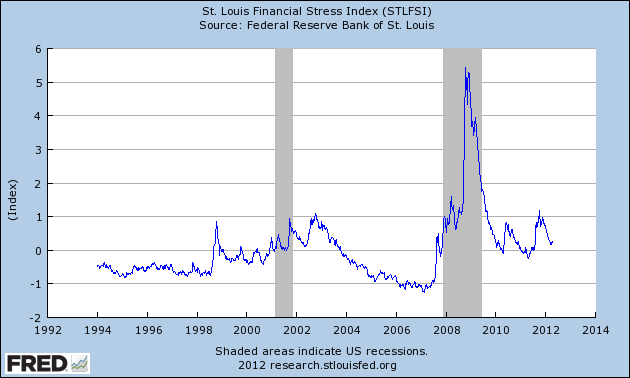 As defined, “The following graphs are all constructed as a percent of the peak in each indicator. This shows when the indicator has bottomed – and when the indicator has returned to the level of the previous peak. 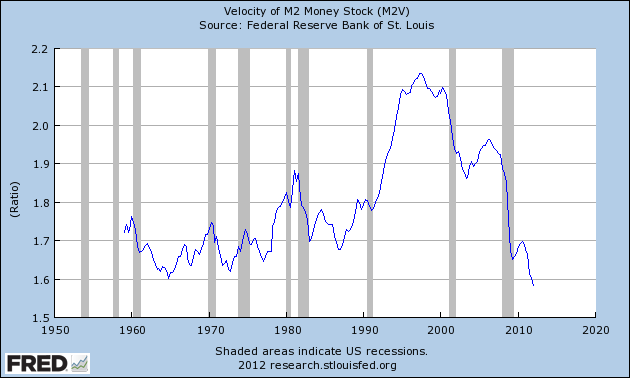 If the indicator is at a new peak, the value is 100%.” Periods of recession, as defined by the NBER, are shown as blue bars. 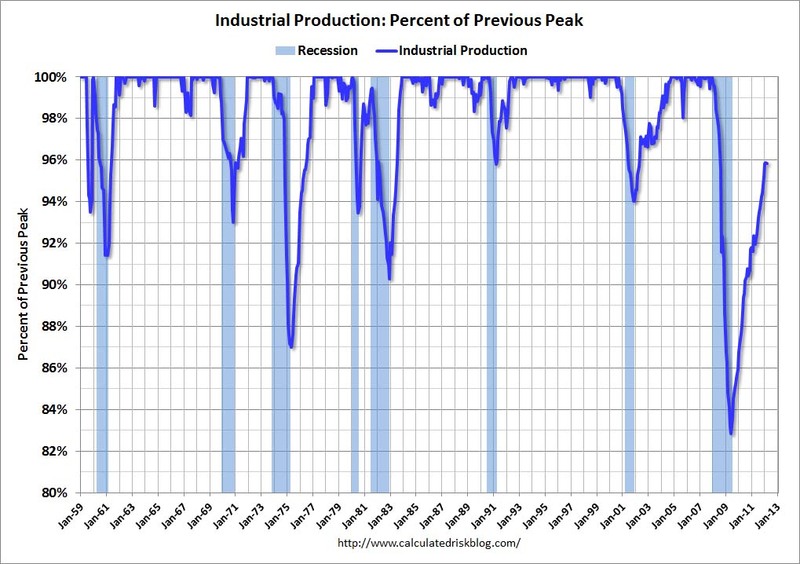 This entry was posted in Uncategorized and tagged "Double-Dip" recession, current economic situation on April 30, 2012 by Ted Kavadas. 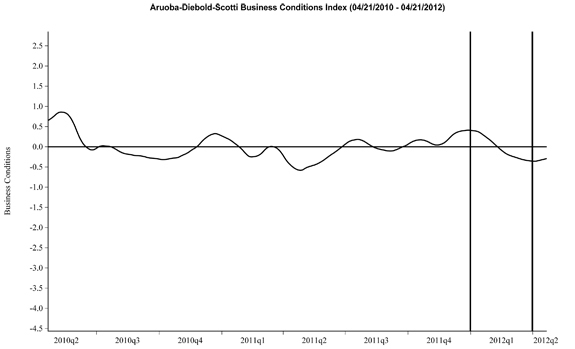 This entry was posted in Uncategorized and tagged economic indicators on April 29, 2012 by Ted Kavadas. 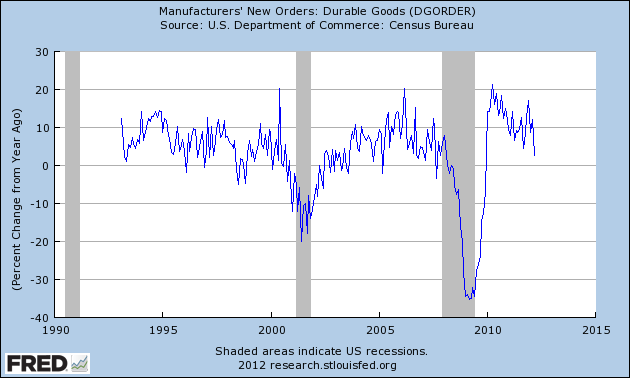 This entry was posted in Economic Forecasts and tagged ECRI on April 28, 2012 by Ted Kavadas. 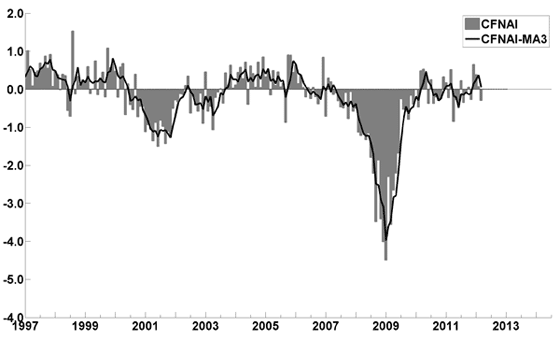 This entry was posted in Economic Forecasts and tagged economic forecasting, economic indicators, STLFSI on April 27, 2012 by Ted Kavadas. On Wednesday, April 25, Ben Bernanke gave his scheduled press conference. Here are Ben Bernanke’s comments I found most notable, in the order they appear in the transcript, although I don’t necessarily agree with them. These comments are excerpted from the “Transcript of Chairman Bernanke’s Press Conference“(preliminary)(pdf) of April 25, 2012, with accompanying economic projections (pdf). Thank you Mr. Chairman, Darren Gersh, Nightly Business Report: Some of your critics, I’m sure you’re not going to be surprised think that you’re still being too cautious that unemployment is still high, the economy may be slowing, inflation is subdued, but I know you just talked about the balance sheet. 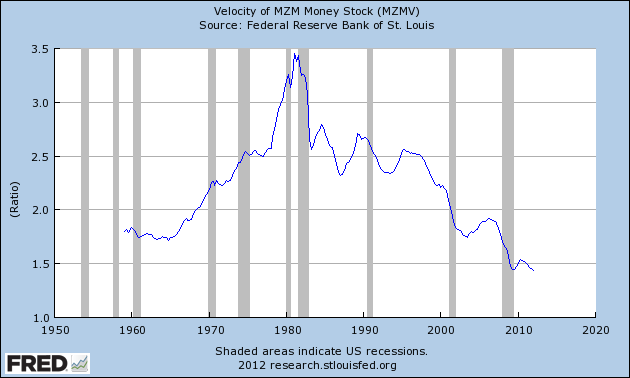 But given that, is the Committee now any closer to QE3 than it was at its last meeting? know, looking at the economic outlook, looking at the risk, whether or not unemployment is making sufficient progress towards this longer run, normal level, and whether inflation is remaining close to target. And if appropriate and depending also on assessment of the costs and risks of additional policy actions, we are–remained entirely prepared to take additional balance sheet actions if necessary to achieve our objectives. So those tools remain very much on the table and we will not hesitate to use them should the economy require that additional support. This entry was posted in Ben Bernanke and tagged Ben Bernanke on April 27, 2012 by Ted Kavadas. 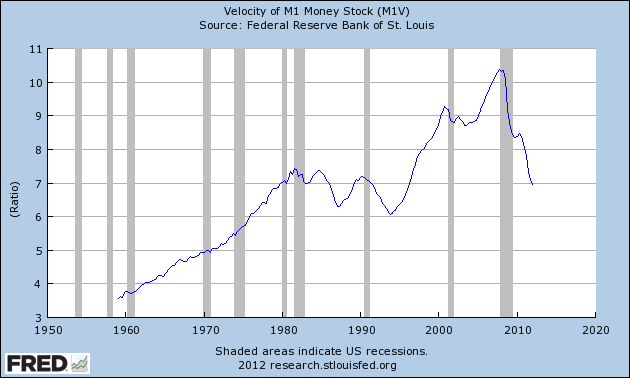 This entry was posted in Uncategorized and tagged economic indicators on April 26, 2012 by Ted Kavadas. 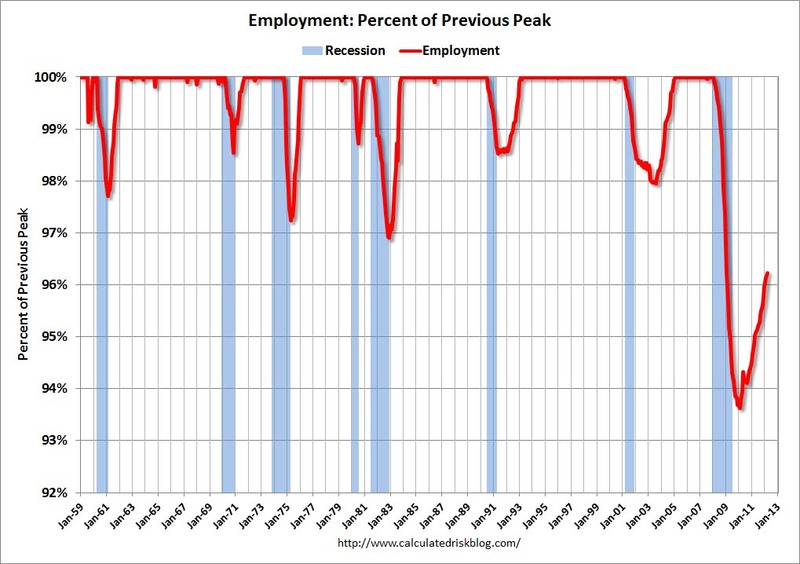 This post, in five parts, will discuss the unemployment situation in the United States. As a prelude, I am of the strong belief that the unemployment situation – and its underlying drivers has, and will, impact the entire U.S. population, not just those unemployed. This impact will be experienced through an adverse combination of individual-specific factors including reduced employment prospects, reduced career advancement probabilities, and reduced compensation and benefits – not to mention an array of adverse macroeconomic factors that have, and will, impact the country’s economic situation as a whole. First, this unemployment aspect of our current economic situation is very complex. This series of posts will present a summary discussion of the topic, as to avoid excessive complexity and length. Second, the current and future unemployment situation varies widely among demographics, industries, and professions. As such, while every employment situation is unique, there is enough commonality as to be able to generalize to some extent. Third, the overall employment situation is, of course, dependent upon the overall economic environment. Fourth, a precursor to this series of blog posts is the July 2009 series of five blog posts titled “Why Aren’t Companies Hiring?”, which discusses various aspects of the topic, many of which lack recognition. Part 2: What Is The Actual Unemployment Rate? As this post is written, the official Unemployment Rate (U-3) is at 8.2%. Some believe that the U-6 rate, currently at 14.5%, is a (closer) proxy of the actual unemployment rate. I like to use these three unemployment rates – the U3, U6, and SGS Alternate Unemployment Rate – as benchmarks; they also serve to (disconcertingly) illustrate how one concept, that of the unemployment rate, can have three vastly different values. As to my belief of the actual unemployment rate, I think that the answer is conditional on many different factors, including – most importantly – how one chooses to define an “unemployed person.” As well, I don’t believe that the framework and methodologies currently used to calculate the official unemployment rate are optimal. Given my misgivings with the framework and methodologies currently utilized, I find it nebulous as to what exactly the actual unemployment rate may be. However, from an “all things considered” standpoint, taking into account my definition of an “unemployed person”, the official unemployment statistics, an array of arguments supporting and refuting the validity of the official unemployment statistics, empirical data, etc., I surmise that the “actual” unemployment rate may well be above 20%, as suggested by the SGS Alternate Unemployment Rate. Of course, if this is actually the case, it would be highly worrisome on a variety of fronts, and have vast implications. This entry was posted in Unemployment and tagged Unemployment, unemployment rate on April 24, 2012 by Ted Kavadas. The story contains the results of the “Spring 2012 Big Money Poll” and related commentary. THE BIG MONEY POLL is published twice yearly by Barron’s, in the spring and fall. The latest survey, prepared with the help of Beta Research in Syosset, N.Y., reflects the responses of 125 money managers nationwide. Some run small or mid-size investment firms, while others manage billions of dollars for banks, mutual-fund companies, endowments, and other institutions. The latest poll was mailed to participants in mid-March. Included in the story are a variety of forecasts regarding the markets and economy. Only 14% of Big Money men and women identify themselves as bears these days, down from 17% last fall. The fence-sitters, or the neutral cohort, are holding steady at 31% of respondents. The bears’ mean prediction puts the Dow at 12,185 by December’s end and 11,738 by next June, the latter down 10% from current levels. In the skeptics’ view, the S&P 500 could revisit 1301 before falling to 1243, while the Nasdaq could tumble to 2693 by mid-2013 from 3000 now. As well, in response to the question “Which is most likely to occur in the U.S. in the next 12 months?” , the most popular response from all of the respondents was “inflation” at 52%, followed by “None will occur” at 26%, “Stagflation” at 18% and “Deflation” at 4%. This entry was posted in Investor, Stock Market and tagged S&P500, S&P500 Earnings, Stock Market on April 23, 2012 by Ted Kavadas. 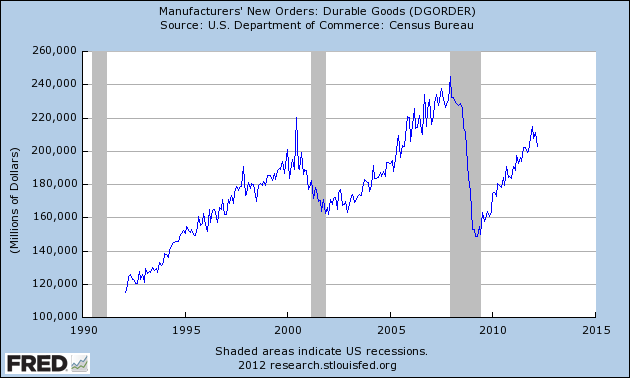 This entry was posted in Economic Forecasts and tagged ECRI on April 22, 2012 by Ted Kavadas.